Welcome to my foodie adventures! As many London foodies will have noticed, the 'small is big' trend has very much made a mark on this city. Small sharing plates have become a go-to for many restaurants in London and Londoners' are loving it, including me of course! Polpetto in Soho is one of these restaurants that have capitalised, refined and delivered in style on this trend. Specialising in small sharing plates with Venetian influences, Polpetto follows on from the high standards set by it's sister restaurant Polpo on Beak Street. Polpetto is modelled to mirror the cosy local Venetian bars and restaurants found along the winding alleys of Venice, and Polpetto pulls this off perfectly. On entering the restaurant there is an instant feeling of comfort and familiarity. The seating on the ground floor is composed of a few intimate booth-like tables and a long red leather banquette. Wooden floors, intricate partitions and glass lamps with low-level lighting add to the soft and inviting vibe. Dining at Polpetto means ordering a host of dishes to share. 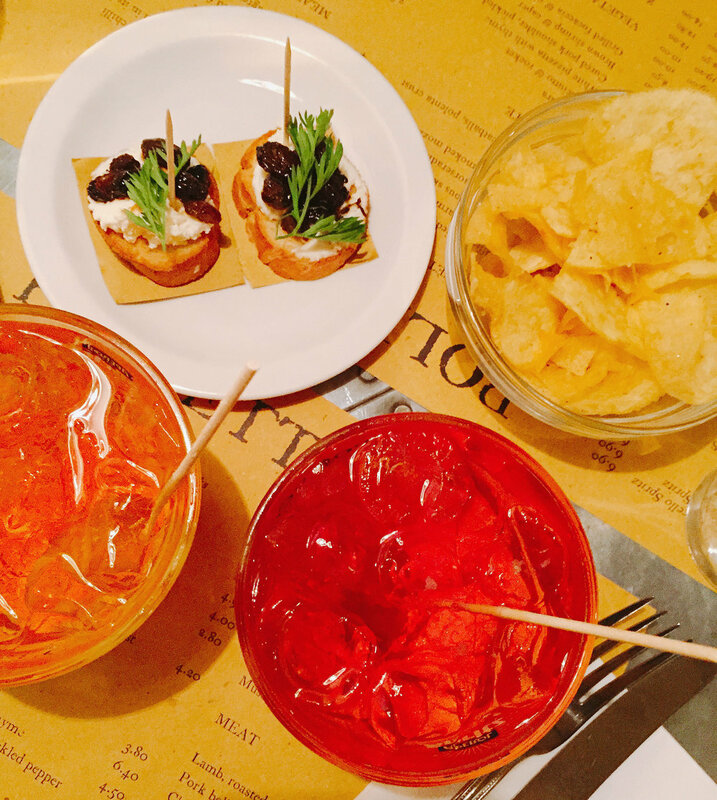 As we arrived during Aperitivo Time we started with Aperol Spritz and bar snacks consisting of irresistible black truffle chips and Bella di Cerignola olives all for £5. We then moved on to order a variety of plates to sample and share from the main menu, which also conveniently doubled up as the table mat. I couldn’t resist ordering the octopus skewers in which the grilled octopus, courgettes and cherry tomatoes were perfectly cooked and seasoned with thyme. This was my favourite dish of the night as it was light and moreish. I also tried the beetroot arancini which had a very overpowering taste of beetroot and were slightly too large to be palatable. We then tried the deep fried squid, zucchini and chilli which arrived as a mountain of squid and was great to nibble on throughout the meal. 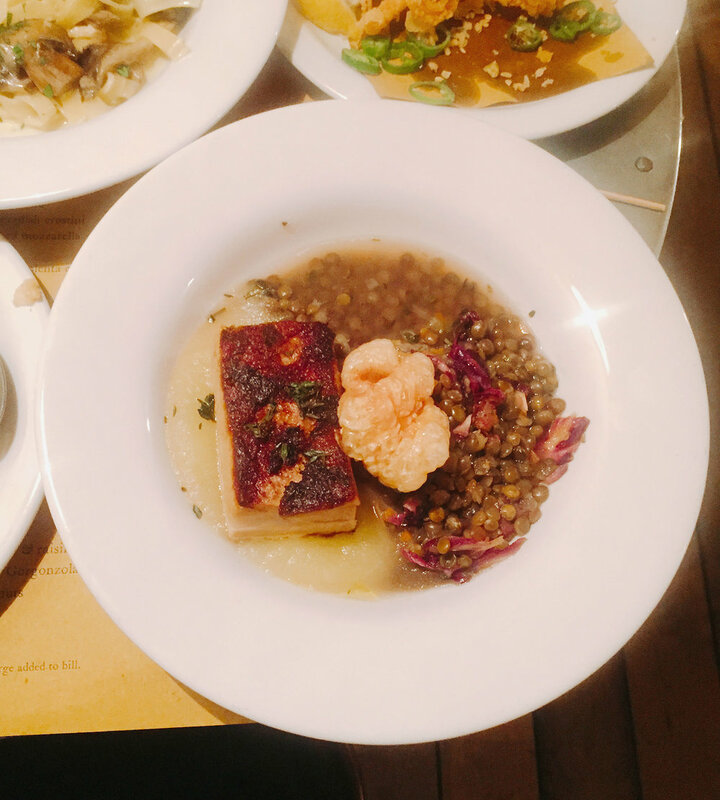 The slightly larger dishes we ordered from the meat section of the menu included pork belly with lentils and radicchio which was a delicious but heavy and filling dish. We also tried the chicken tagiatelle and wild mushroom and pork pizzette which were delectable but much too big to finish, as the portions on these were larger than standard sharing plates. Could I afford to dine here again? The downside to London’s sharing plate craze is that eating like this means the bill can often stack up. However Polpetto’s prices are not deceiving, as although the plates are small, the portions most certainly are not. As a result there is no need to order 'til the table creaks with the weight of the plates. Our meal for two came to a fairly reasonable £55 and there was more than enough food, despite the fact that at first glance it only looks as though we ordered three small plates each. The relaxed and intimate atmosphere and great Aperitivo Time deal makes Poleptto an ideal place to relax in the early evening on a cold night - as it can get quite warm inside in the summer! However, having visited it’s sister restaurant Polpo, I preferred the hearty food there and am more likely to walk a little bit further and visit Polpo instead. Her Favourite Food & Travel! Follow my foodie adventures in London and around the world on my food and travel blog!